As promised I’ve been trying out Yotam Ottolenghi’s recipes from his ‘New Vegetarian’ feature in the Guardian and his caponata has become a favourite for flavour and being relatively simple to do. I love Caponata, and after a trip to Sicily I checked out the recipe in a lovely book called ‘Sweet Honey, Bitter Lemons: Travels in Sicily on a Vespa’ by Matthew Fort, which is also a great recipe and had fewer ingredients, but, I loved the Ottolenghi version for the depth of flavour, helped along by the addition of harissa paste. I left the red pepper out of this recipe, as it is not included in Matthew Fort’s version, but it would be a delicious addition I’m sure. 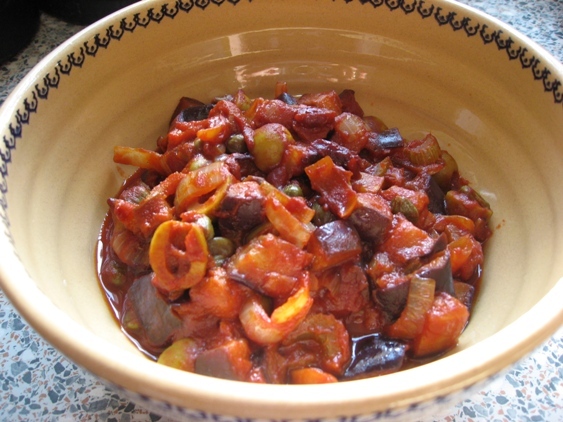 However, Matthew Fort says of caponata that ‘no two recipes are the same’, so I felt free to mess around with the recipe a little! Heat both oils in a large, heavy-based sauté pan for which you have a lid. Lay in the aubergine and fry for five to seven minutes, until golden-brown, stirring occasionally. Use a slotted spoon to transfer the aubergine to a colander and sprinkle with a bit of salt. After a few minutes, transfer to soak on a paper towel. Add the celery to the hot oil, fry for three minutes, add the pepper and cook for two minutes. Transfer to the colander, then to a paper towel. Sauté the onion and harissa in the oil (add a little more to the pan, if need be) for seven minutes, until soft and golden. Drain off any excess oil from the pan, add the tomatoes and vinegar, stir and bring to a simmer. Add the fried vegetables, capers, olives and sugar, and season. If the mix is too dry, add a few tablespoons of water. Bring to a boil, cover and simmer for 10 minutes. Remove the pan from the heat, add the raisins (if using), taste and adjust the seasoning. Leave to come to room temperature, add the lemon juice and parsley, and taste for seasoning again. And lucky me that you dropped by! Thanks and I hope you enjoy the recipe! I love Ottolenghi’s recipes. His books are amazing. I like ‘Jeruselam’ the best. Me too, his recipes always seem so fresh!